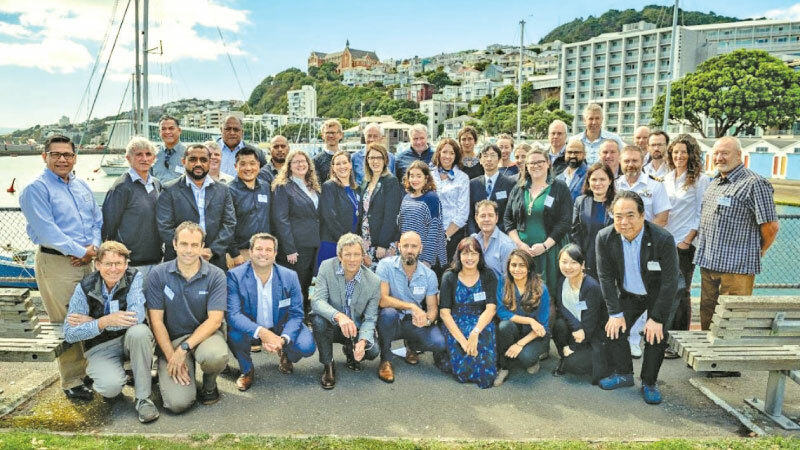 A gathering of ocean mapping experts and maritime officials in Wellington, NZ, was the inaugural mapping meeting of The Nippon Foundation-GEBCO Seabed 2030 Project’s South and West Pacific regional data centre. Among the outcomes of the meeting was a commitment to identify unmapped areas within the centre’s remit – around 124 million square kilometres of ocean – with the ultimate aim of seeing these areas included in a complete and definitive map of the world’s ocean floor by the year 2030. Seabed 2030 divides responsibility for coordinating data identification, collection and inclusion in regional datasets between four regional centres, each covering different areas of the ocean. These centres are located at the Alfred Wegener Institute (AWI) in Germany, covering the Southern Ocean; the National Institute of Water and Atmospheric Research (NIWA) in Wellington, New Zealand, covering the South and West Pacific Ocean; the Lamont Doherty Earth Observatory at Columbia University, USA, covering the Atlantic and Indian Oceans; and at Stockholm University in Sweden, in partnership with the University of New Hampshire, USA, for the Arctic and North Pacific Ocean. Regional products are fed in to the Global Data and Coordination Centre hosted at the British Oceanographic Data Centre in Southampton, UK. With the successful conclusion of the meeting in Wellington, all four of the regional centres have now held their first meetings under the Seabed 2030 project. The workshop, held from 4-6 March at the Royal Port Nicholson Yacht Club, was convened and chaired by Dr Geoffroy Lamarche, who leads the South and West Pacific regional data and coordination centre based at New Zealand’s NIWA. The centre is responsible for an ocean area from the west coast of South America to the east coast of Australia, and north to Japan, Korea, and China. The three-day meeting brought together representatives from scientific research institutions, government bodies and industry. Forty-three people from 13 countries attended the workshop, including five alumni of The Nippon Foundation/GEBCO Postgraduate Training Programme, while two connected to proceedings remotely from New Caledonia. Attendees received a formal Māori welcome, and the workshop was opened with an address from Dr Robin Falconer, former Chair of the GEBCO Guiding Committee and member of the Seabed 2030 establishment team. The first day heard presentations on Seabed 2030, the progress made so far by the South and West Pacific centre, and the ways in which organisations and initiatives can benefit from – and contribute to – the project. These included NIWA, the Japan Coast Guard, the Japan Agency for Marine-Earth Science and Technology (JAMSTEC), Geoscience Australia, James Cook University, and the French Naval Hydrographic and Oceanographic Service (SHOM), while the meeting also received an update on progress at the Arctic and North Pacific regional centre. The second day began with an update on The Nippon Foundation-GEBCO Alumni Team from Evgenia Bazhenova, Data Manager at the South and West Pacific Regional Centre and a member of the team which reached the final round of the Shell Ocean Discovery XPRIZE. Technical presentations focused on data portals and data sharing, and the potential benefits that satellite-derived bathymetry could offer Seabed 2030. Contributors included a representative of the International Hydrographic Organization (IHO) Data Centre for Digital Bathymetry, as well as from the Open Geospatial Consortium, the Environmental Systems Research Institute (ESRI), the Australasian Hydrographic Society, and others. The workshop concluded on the third day with a summary and action session led by Dr Lamarche. The meeting agreed on a list of action points for further collaborative working, which included identifying priority areas within the South and West Pacific Ocean for which no mapping data exist; commitments to establishing a strategy for communication with different maritime industries and connecting with national initiatives; and setting out data submission and attribution procedures. “These regional centre meetings are a crucial platform for identifying and galvanising complementary mapping efforts throughout our areas of responsibility, and focusing them around the common goal of the Seabed 2030 project”, said Dr Geoffroy Lamarche.